After saving Nathaniel’s hide on multiple occasions, Bartimaeus the djinni is fed up. Nathaniel, his magician master, has kept him hard at work plastering propaganda posters on walls and taking care of other duties required by Nathaniel’s new role as information officer for the magical government of England. And Bartimaeus has had to do all this work without ever being dismissed for even a short sojourn to his home, The Other Place, where his essence can get recharged. So he’s weak and enslaved, and just about the only thing he can do about it is taunt Nathaniel whenever possible by taking on the form of Kitty, the resistance fighter Nathaniel believes to be dead. This is where things stand at the beginning of Ptolemy’s Gate, the third and final book in Jonathan Stroud’s Bartimaeus trilogy. I enjoyed the first book, The Amulet of Samarkand, mostly for the world building, Bartimaeus’s witty narrative voice, and the potential it showed for having characters that might develop in unexpected ways. The second book, The Golem’s Eye, improved on the first with the addition of Kitty, a wonderful counterpoint to Nathaniel, as well as exciting set pieces and an expansion of the world into the realm of politics and rebellion. This book surpassed them both, bringing the series to an absolutely thrilling conclusion that goes far beyond anything I’d expected. With this final book, the Bartimaeus trilogy does not merely live up to its potential—it outstrips it. Once again, we have all the elements that make the previous books so charming, but we also have lots of new developments and payoffs galore. Both of the previous books contained standalone plots, with villains who were defeated by the end of book. In Ptolemy’s Gate, we see how the disparate elements fit together. Threads that seemed incidental to the main plot are worked into the story in a way that never feels forced, and the characters grow in surprising ways. Niggling questions are answered, characters’ fates are determined, and the world goes far beyond the borders of magical London. And that, my friends, is all I can tell you because much of my pleasure in this book was the glee I felt in watching events unfold. I laughed, I cried, I squealed in delight. And I did not want the story to end. Lucky for me, Jonathan Stroud is working on a prequel about one of Bartimaeus’s earlier adventures, to be published later this year. It won’t be the same without Nathaniel and Kitty, but I’ll take what I can get. I’m delighted you love this series. I have the first book of it and I can see that I should really dig it out and read it – and get hold of the subsequent two volumes! 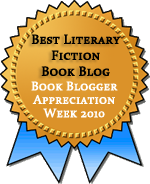 litlove, it is well worth reading when you’re in the mood for fantasy–especially this last book (although you do need to read the others first). Am taking The Amulet of Samarkhand on a beach vacation this weekend—thanks for your posts on these books, they definitely influenced me to finally get round to reading Stroud! sanchiad: Oh, I do hope you enjoy it! I read the first one of these and wasn’t really grabbed by it. I can see it must have been my mood. I think I’ll try them again — it’s the rare series where they get better instead of diminishing. Jenny, Oh yes, these definitely get better as they go. I found the first book entertaining enough, but the second book got me absolutely hooked. I think the addition of Kitty was a huge improvement. She provides a moral core that the first book lacked. You do need to read them, Ana. And yes, with this book, all I can do is wax enthusiastic. 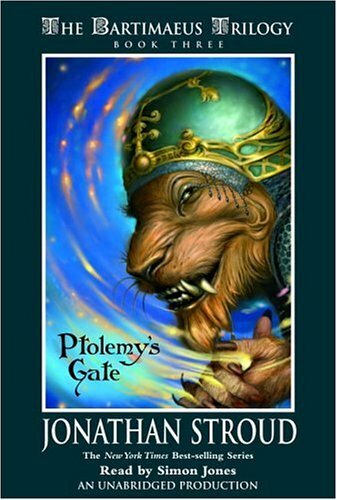 Pingback: Ptolemy’s Gate (Bartimaeus Trilogy #3) by Jonathan Stroud | Fantasy Books!